The game will not run on dual core systems, See Black screen at launch on dual core CPU systems for a workaround. Can only be bought via the Season Pass. Note that when following the guide, the packing/unpacking process can create long file paths, and may fail if they exceed the maximum acceptable length. To combat this, move the data_win32 folder to the root directory on your drive before you start, then put it back in place once done. Aspect ratios other than 16:9 are letterboxed (see the WSGF entry). Sets to the lowest FOV value. FOV slider disappears at 21:9 or wider ratios. Use a modified FC64.dll file to re-enable it. Up to 4x TXAA (Nvidia only), up to 8x MSAA, and SMAA. See Far Cry 4 Depth Of Field disabler. 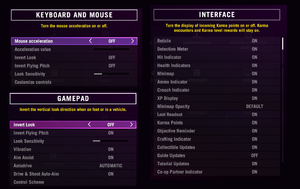 Keyboard, mouse and basic controller settings. Mouse wheel cannot properly be bound to cycle weapons, as forward and backward on the mouse wheel are both considered the same command by the game when bound to anything other than the default switch grenades command. Options menu has a "mouse acceleration" setting and slider. However, even if disabled, there is still a heavy amount of mouse acceleration. 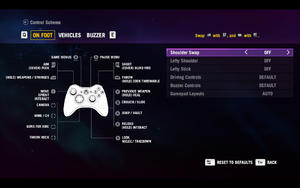 Native support for DualShock 4 (including touchpad), Xbox One, Xbox 360 controllers and Logitech controllers. The mouse curve was improved in patch 1.5.0. Disabling acceleration from the menu still leaves some acceleration and smoothing enabled. Disabling all values from the configuration file should minimize the effect. Acceleration cannot be disabled completely. Low DPI mice are more susceptible to this issue. Locate values MouseAccelerationOn, MouseAcceleration, Smoothness, Smoothness_Ironsight and UseMouseSmooth and change them from 1 to 0. Locate IronsightToggleMode and change the value to 1. PvP (Overrun) mode requires paid DLC. Can not play the main campaign in co-op, only the side missions and towers. Progress in the player is saved for both parties but progress in game is only saved for the host. 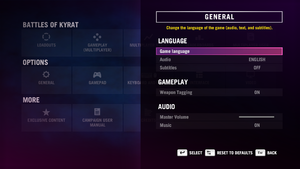 Use Helix Mod: Far Cry 4. This can happen when controller is plugged in. 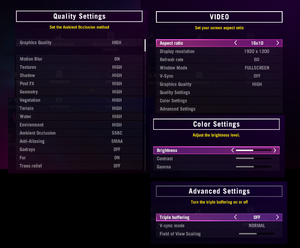 In-game, open the settings menu. Locate "Karma Points" and make sure it is turned ON. Locate DisableLoadingMip0 and change the value to 1, you may also change the value of GPUMaxBufferedFrames to 1. Download Fix and extract file to <path-to-game>/bin/. Start Far Cry 4 and load your saved game. Open fc4_blackbars_fix, press "Remove" and wait until it's done. You have to follow these steps everytime you launch the game. Complete the prologue to enable saving. This fix requires usage of third party exe and DLL files. Use with extreme caution as your account can be banned. First off, download the required files down below. Do NOT use Xenos64.exe found with the DLL files, as it doesn't work - delete the file. Copy all the files from above to <path-to-game>/bin/. Copy and paste these batch lines into a empty batch file and save it somewhere in <path-to-game>/bin/, I named mine to FarCry4Launcher.bat. Rename the extreme injector executable you just extracted to ei3.exe or adjust the script - it is up to you. Add ei3.exe as an exception in your anti-virus program, or it might pick it up as a riskware. Run Extreme Injector, go to Settings and tick Auto Inject and select OK. Select Add DLL and select dualcore.dll which should be in <path-to-game>/bin/. In Process Name type in FarCry4.exe. Extreme Injector should now be configured correct, you should see a settings.xml which contains the config which you just modified. Enable the following compatibility settings for the ei3.exe file: Run this program as an administrator; and lastly press OK to save your changes. 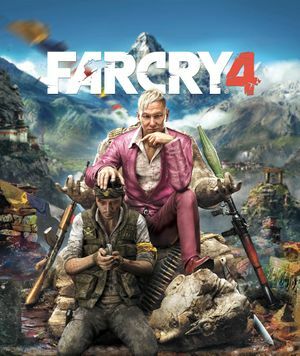 Now try launching the custom batch file, it should automatically start Far Cry 4 and Extreme Injector together and the game will start successfully. You might make a shortcut of the batch file and save it to your desktop. Or see below if you want to add it to your Steam library. You'll have to be a bit quick accepting the UAC prompt everytime you launch the batch file. You may also add the game to Steam, add a non-Steam game and select cmd.exe found in System32 and add the argument /C "<path-to-game>/bin/*your_batch_file*.bat". But your friends will see the game as a non-Steam game. The game doesn't tell why it's crashing on launch. Use the Windows Event Log to find the cause. Go to <path-to-game>\Support\Software\VCRedist and install vcredist_x64.exe or download the redistributables directly from Microsoft. ↑ 1.0 1.1 File/folder structure within this directory reflects the path(s) listed for Windows and/or Steam game data (use Wine regedit to access Windows registry paths). Games with Steam Cloud support may store data in ~/.steam/steam/userdata/<user-id>/298110/ in addition to or instead of this directory. The app ID (298110) may differ in some cases. Treat backslashes as forward slashes. See the glossary page for details.